Seconds left on the clock, down by one point, and all eyes are on you as you secure the win for your team. 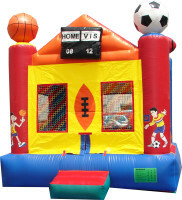 This sports lover's fantasy can become a reality with the Sports Arena Bounce moonwalk rental. Whether you love basketball, soccer, or football, you're sure to play the game of your life!